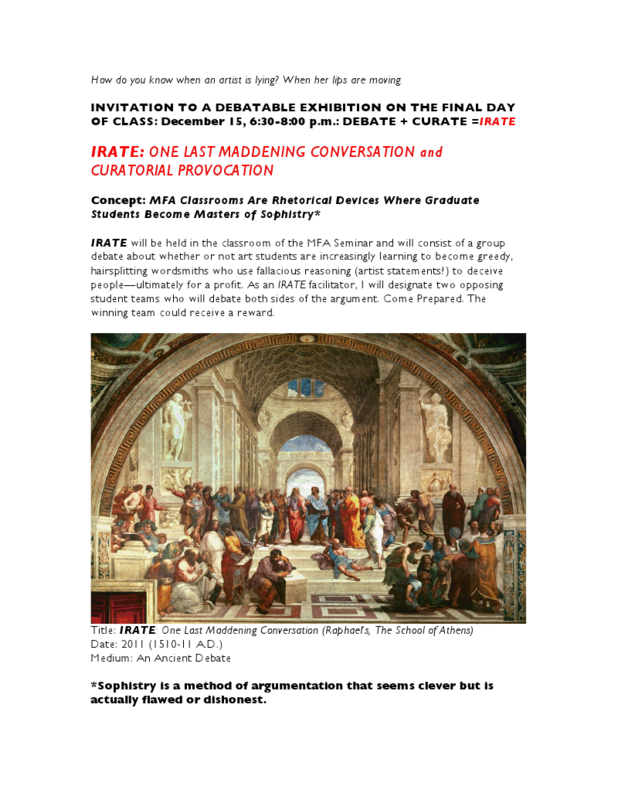 Masters of Art or Sophistry? The semester is winding down, and the MFA artists in Towson’s MFA seminar are preparing for their last assignment. Ready to find out what it is? Now that you know the concept behind IRATE, its time to chime in. Tell us what you think. Does the MFA create masters of art or masters of sophistry? Note, IRATE is for discussion purposes only, it does not necessarily represent the opinions and views of the DCCA or Towson University. As you know there are 13 artists from Towson University in the MFA Biennial. These artists are participating in the show as part of a “hands-on” seminar course about “the history and changing definition of curating”. Additionally, the seminar addresses “conceptual approaches to and methods of organizing exhibitions”. Essentially, the purpose of the class is to learn how to create curatorial proposals and innovative and interactive exhibitions. One of the assignments for the seminar was to create an educational project for the Masters of the Visual Universe. I was able to work some magic and obtain the seminar’s syllabus. Since its a little long, I created a new page for the syllbus. I really encourage you to check it out.